Figures are new in sealed packaging - cardboard mailer is included Figure measures approximately 6" tall Recreate the Second Ultimate Battleground as Rotar and Twistoid go head to head! A former palace guard wounded in battle, Rotar was merged with an android body resulting in fists of fury fueled by his hyper spin powers. 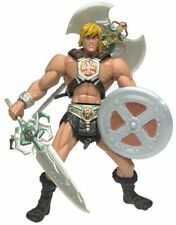 He now protects Eternia® as one of theMasters of the Universe®®! Rotars nemesis Twistoid is a Gyro Robot who serves Skeletor®. Using super spinning action, Twistoid wields a ball and chain, whirling sword, and terror gears to defeat his enemies.. Figure is new in sealed packaging - cardboard mailer is included Figure measures approximately 6" tall Once a snake, not always a snake… when provoked, this wretched reptile reveals himself to be an entire mass of them! Our fully articulated Dreadful Disguised Leader of the Evil Snake Men is armed and ready to strike with his shield of Ka. He also comes with a magic snake staff and interchangeable articulated snake form torso to complete his serpent-like transformation. Please Note: This King Hssss figure does not include the retooled shoulders created for Draegoman. It was produced some time ago and is identical to the first run. .
Super7 Limited Edition. Masters of the Universe. ReAction 3.75". Each item is inspected, graded, and verified by two people before being accepted. Collector’s Grade. Figure is new in sealed packaging - cardboard mailer is included Figure measures approximately 6" tall This crafty crook from the dark side of Eternia® steals all the books, but its not his thirst for knowledge that motivates him… its his thirst for power! Wicked, winged and willing to scheme with Skeletor®, this Filmation series fiend comes with a mace. .
Vintage He-Man MOTU figure lot: HE-MAN and BATTLE CAT Complete 1981. Condition is Used. Shipped with USPS Priority Mail. Thank you for bidding. Please have payment sent with in 48 hours of the winning bid or order will be cancelled. Combined shipping available with in the conus. If a delay occurs, you'll receive a free random bonus part. As you may read in my profile, you'll find it's worth the wait! IF so, you'll receive a FREE Random Bonus. For heads, there is no tack, sanding or drilling required - just pop them on standard bodies. Vintage 1981 He-Man Action Figure Soft Head Masters of the Universe MOTU Mattel. Condition is Used. FEMALE FOOT STAND : teela, evil lyn. Our artisan stands are printed in safe, 100% biodegradable, non-toxic PLA material. PLA stands for Polylactic acid and is a 3D printable plastic made from corn-starch or sugar cane. Figure is new in sealed packaging - cardboard mailer is included Figure measures approximately 6" tall . 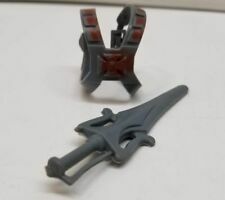 Hello and thanks for looking at: Vintage He Man Mattel Masters of the Universe MOTU Weapons Armor lot Please see Pictures I try to describe my items as best as possible and take the best pictures possible, however if any issues with orders arise feel free to message me and it will be resolved quickly! I think you will see that I work hard to make you happy and will do whatever it takes for you to return to MamaJuju's Lair Toys & Collectables. And as always have a wonderful day and thanks for looking!! Mattel Masters of the Universe Man-At-Arms Figure. Condition is Used. Shipped with USPS Priority Mail. The decal on his chest is intact. THE ONE IN THE CENTER IS IN EXCELENT CONDITION STANDS UP,THEONE ON LEFT THUM IS BROKEN. ALL HAVE SOFT HEADS AND ON FADING. This is a incomplete castle also the door has been glued. MOTU Vintage Original HE-MAN with shield. Been in a plastic bag for a very long time, in very good shape. 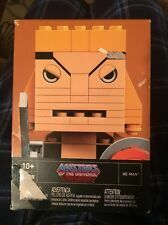 New ListingMasters of the Universe 1986 Rattlor Action Figure complete with comic! It is from wave 5 and complete with comic And cardboard backing. See pictures. Figure is new in sealed packaging - cardboard mailer is included Figure measures approximately 6" tall Sometimes one evil robot just isn’t enough to get the job done. Luckily Multi-Bot comes with two robot torsos, two robot heads, six legs, four arms, two guns and other assorted pieces that mix and match for endless evil opportunities. It’s almost like Modulok had an evil robot half-brother!. 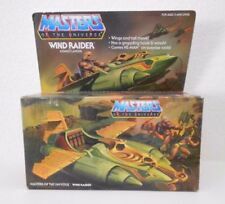 He-Man Masters of the Universe Meteorbs Rhinorb Action figure complete 1987. Condition is Used. Shipped with USPS First Class Package. Our artisan stands are printed in safe, 100% biodegradable, non-toxic PLA material. PLA stands for Polylactic acid and is a 3D printable plastic made from corn-starch or sugar cane. 3D printed products made with PLA are durable and strong, but can start warping in high temperatures such as setting them out in direct sunlight or in your car. Body is in good shape with very little wear and tear. No stress marks and very few scratches. Back half of blueBattle Ram. No missiles. Most of the stickers are intact. Wheels and body show signs of wear and tear. MOTU Masters of the Universe MOSQUITOR Vintage He-Man Blood Pumps. Condition is used/played with. Comes just as shown. Please check out all photos and be sure to email me with any questions. Thanks for looking! Figure is new in sealed packaging - cardboard mailer is included Figure measures approximately 6" tall Bow™ may be an expert marksman, but he’s no Cupid -- all the magic arrows in the world won’t deliver him his one true love, Adora. 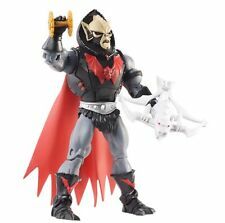 The first and only male character from the Princess of Power™ series to be created in scale with all otherMasters of the Universe®™ Classics figures has been completely re-imagined by the Four Horsemen, including “bowman’s wrist” articulation so he can properly hold his bow and arrow. Although he does come complete with the following accessories, he is still without the key to his Princess’s heart. Flying Fist He Man. Poses nicely. I have sold well over 1000 lots. Vintage He-Man Masters of the Universe Snake Mountain. Condition is Used. Shipped with USPS Priority Mail. Please see pics. Hinges and tabs are good. See parts. Thank you for bidding. Please have payment sent with in 48 hours of the winning bid or order will be cancelled. Combined shipping available with in the conus. 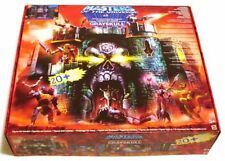 Mattel Masters of the Universe He-Man Action Figures. Lot of 14. Condition is Used. Figure with rotating face has both legs, but not attached. Man-at-arms, ironically, has no arms. Original owner. Small amounts of play wear. 100% Complete.